Nearly half the world’s adults have a smartphone and although there is still a significant gap between developed and developing countries, the gap is closing rapidly. 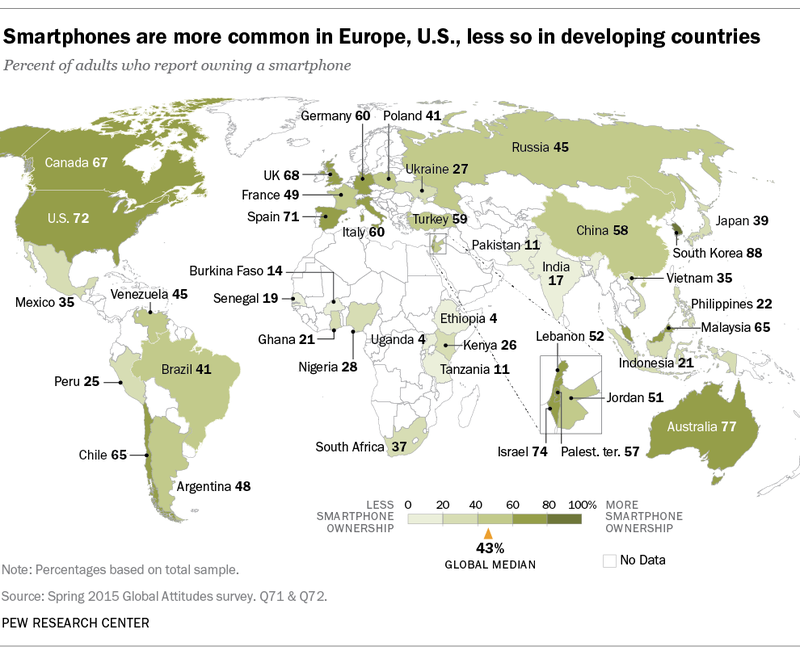 A Pew Research Center analysis based on a survey of 40 nations in Spring 2015, puts global adult smartphone ownership at 43%. Sales of smartphones are booming, with more than 1.4 billion sold in 2015 and the figure is expected to be higher still this year. Richer economies still have a higher level of smartphone ownership, with South Korea coming top with 88% of people owning a smartphone. Of major regions, the United States came top with 72%, followed by Europe (60%) and the Middle East (57%. ), Less than half (43%) of Latin Americans have a smartphone. In Asia/Pacific more people own a mobile phone than a smartphone, and in Africa less than one in five people use a smartphone. The smartphone digital divide is clear, with a difference of 84 percentage points between the country with the most smartphone owners, South Korea, and the country with the least – Ethiopia at 4%. Pew notes that here is a strong correlation between country wealth and smartphone ownership, which corresponds with the digital divide for internet connectivity. Smartphone ownership rates have skyrocketed in many countries since 2013 and the report shows just how quickly the disparity is diminishing. Turkey has seen ownership increase by 42 percentage points, Malaysia by 34, and Brazil and Chile by 26. In fact, in emerging and developing countries, the average figure for smartphone ownership figure has risen from 21% to 37% in just two years.